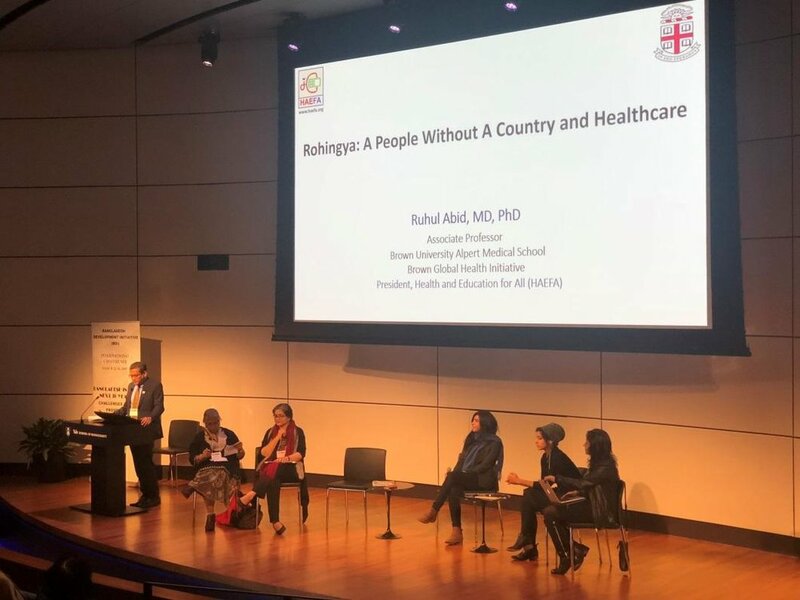 On March 22, 2019, our co-founder, Dr. Ruhul Abid, represented HAEFA at the Bangladesh Development Initiative (BDI) International Conference, which took place at Yale School of Management. 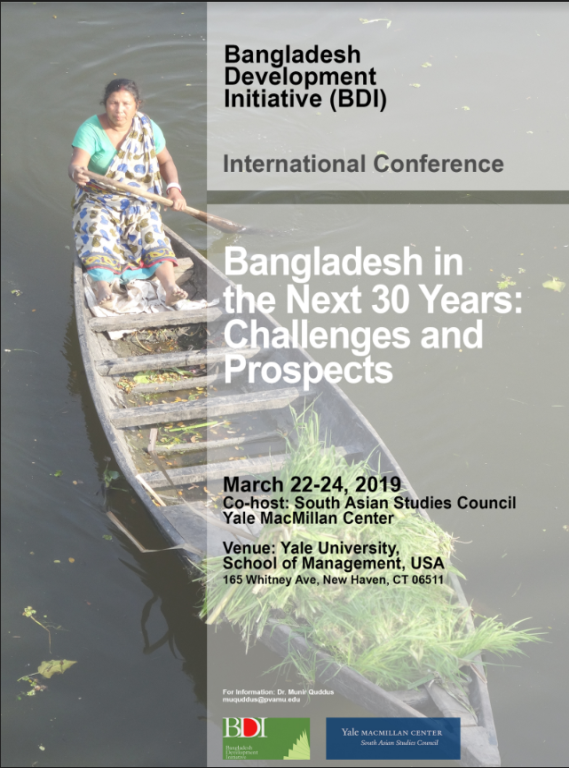 BDI is a USA-based non-profit organization and takes a broad view of development and includes professionals from various disciplines who are involved in supporting social development initiatives in Bangladesh. The BDI 2019 conference featured critical thinkers, change makers, thought leaders, young scholars, experienced educators, eminent journalists, lawyers and human right activists, development specialists, NGO representatives, practitioners, and students. The goal of the conference was to create an inviting space for discussions on diverse issues that are relevant to the future development of Bangladesh. This year, the conference included a plenary session on the Rohingya refugee crisis, a humanitarian disaster that has affected Bangladesh on many fronts, central to our focus at HAEFA. As part of the crisis, Bangladesh has hosted today nearly a million oppressed and desperate people from neighboring country Myanmar. An Update from Dr. Noman in Bangladesh: Our workers in Cox Bazar have endured the inevitable weather of bangladesh. The storms and rain have made it extremely dangerous for various groups to travel to the camp, yet the HAEFA team has braved the treacherous hills and paths to continue their work. The main roads have all been flooded with relentless storms. As they continue to fill up water, there have been 2 car accidents in the Cox Bazar area, and the team fears their transportation is not suitable for this situation. These challenges are no match for the commitment of the HAEFA team as they refuse to halt their responsibilities. We thank them for their hard work and dedication, sending our love and prayers to Cox Bazar. 1. 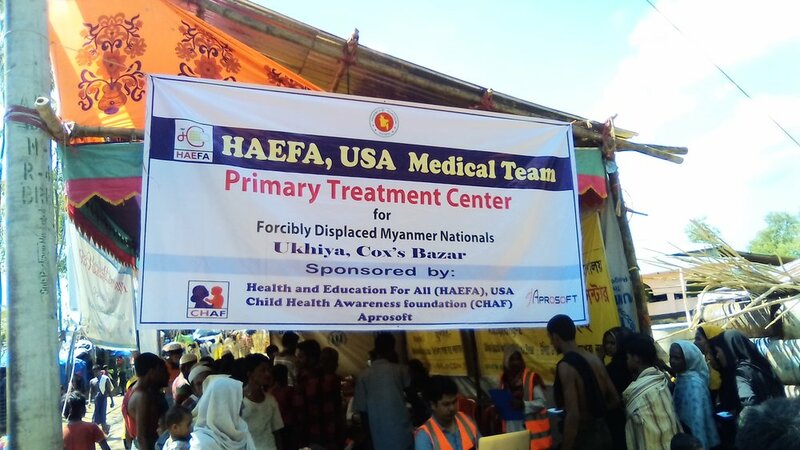 With your donation, support, and Zakat, HAEFA has provided free treatment and medicine to more than 31,000 patients in the Rohingya camps since October 2017. Watch this recent short-film from the Rohingya camps. Please donate online using the donate or Zakat tab, or mail check to: HAEFA, 311 Bedford St, Lexington, MA 02420. Your donation is tax-exempt as allowed by the US laws. On average, with $2.50, you can provide free treatment including medicine to one patient. $25 can treat 10 patients; $250 can treat 100 patients. 2. PwC Foundation and Better Shelter have been building two semi-durable structures for HAEFA's medical tents in Kutupalong and Balukhali Rohingya camps. We expect these structures will be completed by mid-June 2018, which will provide better environment for the HAEFA medical teams as well as covered waiting spaces for our patients. 3. The Semnani Family Foundation, USA has promised partial grant support for HAEFA's ongoing Rohingya healthcare projects for one year. Using a very simple paperless digital technology, HAEFA medical teams in Kutupalong and Balukhali, Ukhiya Rohingya camps have been providing medical care and medicines to around 300 patients per day since October 9, 2017. In these remote places without electricity and 3G phone lines, our dedicated members of HAEFA have been using solar panels to charge the local wifi router, laptop and handheld TABs to register patients and store their medical records. Each patient is followed up longitudinally for further treatment using their digital health-card containing a picture and a scannable unique barcode. Salute to our dedicated HAEFA medical professionals who have been serving humanity in a very harsh and unhygienic condition 6 days per week! Prof. Dr. Jane Carter (past President of International UNION against TB and Prof. of Infectious Disease) and Dr. Ruhul Abid, President, HAEFA will be working from October 26 to November 5, 2017 with two of our 16-member medical teams that have been working in Kutupalong and Balukhali in Ukhiya, Cox's Bazar since the beginning of October. They will visit all the FDMN (Rohingya) refugee camps in Ukhiya and Teknaf regions, and meet with the people, and the organizations working there for need assessment and to develop effective treatment strategies. We are sending a well-trained 16-member medical team of physicians and paramedics/health workers a to Cox's Bazar, Bangladesh to serve the Rohingya refugees initially for three months. We will extend the services depending on the need and continued medicine supplies. Our Medical team will work in coordination with the Control Room to set up the government and will also coordinate/collaborate with other interested organizations including CDC, IEDCR, UNFPA, UNHCR, etc for mass vaccination of the children and adults, treatment, wound dressing and emergency management, for 800,000 Rohingya refugees. We are raising funds locally (in the USA, tax-exempt 501c3) and also in Bangladesh. We are also collecting medicines and other medical supplies, and a transport van to be used in the local areas to carry medical team and daily supplies of medicines/salines/etc. If you or your organization or someone you know would be interested to participate and/or contribute/donate to the cause, please use the DONATE tab above. You may also visit our Facebook page here. Here at Health on Wheels (an on-site healthcare delivery project of Health and Education for All, HAEFA, USA), we are aware of the importance of transparency with the public. Our support comes from you and you deserve to know what we have been up to recently. As you know that our main target population is marginalized population of the society, such as garment factory workers, rickshaw pullers. We are glad to inform you that we have successfully screened for diseases, provided treatment and follow ups free-of-cost to thousands of garment workers at factories like Aman Garment Ltd. (in Savar), Envoy Textiles Ltd. (Bhaluka, Mymensingh), Columbia Garment Ltd. (in Gazipur), Avant Garment Ltd. (in Sreepur, Mawna), and more. Through our health screening programs we have been able to learn a great deal about the health situation among garment workers and what diseases are affecting them the most. Health screenings at this scale allow for data collection that will enable us to focus on the issues that matter most to workers and lead to a more effective healthcare program specialized for the garment workers we work with. Along with initial health screenings, we use our collected data to identify individuals with potential health issues in the future and send our Health Workers (HWs) to the garment factories periodically to follow up, monitor, and treat those who need the care most. We provide all these services free of cost. Our on-site workshops held at the factories also allow us to develop a stronger connection with the workers and the management and discuss what they desire from our program in the future as well as ways that we can improve our current operations. With the feedback that we receive from the workers and management, Health on Wheels intends to keep growing and expanding the service area in order to provide help where it is needed most. Apart from the garment workers, we have started another health screening and treatment project in November 2016 focusing on the rickshaw pullers, a large section of populace work in this informal sector of Bangladesh. There are 80,000 registered rickshaws in Dhaka alone, and there are approximately 2-3 rickshaw-pullers per rickshaw making a labor force of almost 200,000 people in this profession. We started our project initially through health screening for common communicable and non-communicable chronic diseases with the collaboration of Gulshan Society, powered by our IT partner APROSOFT and local implementation partner CHAF on 9th and 10th November, 2016. There we provided health services including electronic health card and free-of-cost treatment to around 1200 rickshaw pullers. The project is tending to expand with construction of a health center with outpatient and 10-bed inpatient facilities in nearby Badda region where many of the rickshaw pullers and their families live. HAEFA with joint support from the GS and Dhaka City Corporation will engender a self-sustained fund for the maintenance of the hospital. The hospital will cover a comprehensive health care through a ‘cooperative health insurance’ providing both indoor and outdoor facilities not only to the rickshaw pullers but also to their respective families. Both the garment workers and rickshaw pullers are provided with a digital health card with their identification number and a scannable barcode. Our unique NIROG software stores all the health information of the card holders through Microsoft’s Cloud (Azure) system under strict encryption of the data. In Bangladesh, there are very few usage of digital or electronic technology and internet/Cloud-based data entry and storage. Our healthcare initiative using our custom-made NIROG software will thus make authentic health information accessible to appropriate healthcare providers and authorities. It will also help our care providers and health policy makers to access and provide evidence-based health care to the marginalized population of the society. Our continued health care service delivery to the marginalized population of the society including garment workers and rickshaw pullers will also help the government and other stakeholders in developing effective policy planning to achieve Universal Health Coverage in Bangladesh by 2030. We do strongly hope that you will support us in our vision of Health and Education for All. Health On Wheels was created to make a huge difference through small changes. Understanding the barriers and obstacles underprivileged people face around the world, Health On Wheels is there to ease through those barriers and gently overcome those obstacles with solutions that are easy to implement and inexpensive to provide. Yet these small changes significantly improve the lives of those we touch. We provide health screenings, preventative care and immunizations for common and curable diseases, along with education to help these communities live self-sufficient, healthier, happier and more productive lives. Caring for workers in garment factories, urban slums and poverty-stricken areas around the globe, we focus especially on women, children, aged and disabled workers.